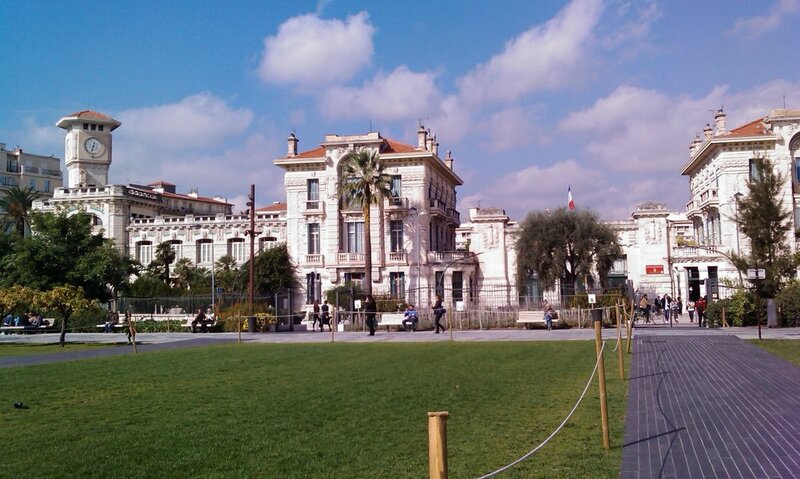 A business trip to the French Riviera. This was a business trip, so I didn't think to bring a proper camera. When faced with such an incredibly beautiful place, begging to be photographed, I resorted to using the only alternative I had; a 2008 mobile phone, with enough memory left for just 32 photographs (OK, I actually took a lot more, and deleted the junk as I went), and an aging battery that could barely last for more than a few hours. The camera is quite poor, with significant vignetting, a blue-to-purple fade from left-to-right, and no exposure locking. Stitching panoramas when faced with the output from such a camera is a minor nightmare, having to correct for each problem in turn, before rotating and skewing for perspective. So no, I did not stitch the pictures manually. They are automatically stitched using Microsoft ICE, which can correct all of the flaws. Since one of the panoramas includes an angular car park, automatic stitching would have been preferred anyway. There are some very visible stitches, especially in moving surfaces like the sea, but it is what it is. 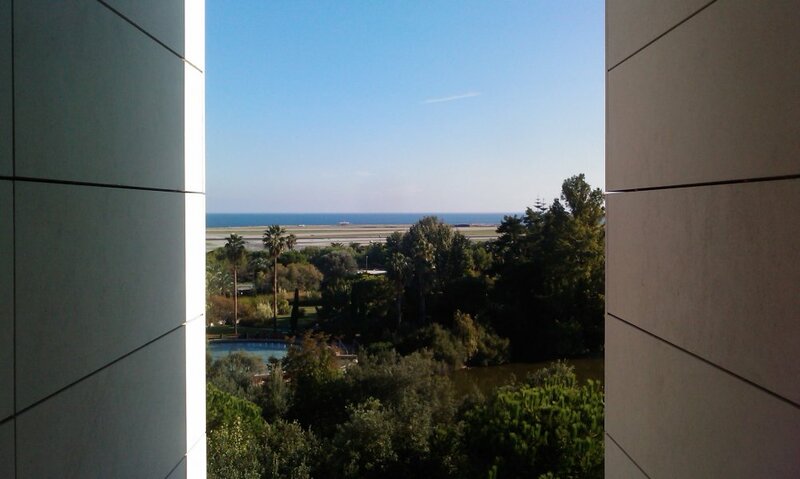 View of the Mediterranean Sea over Parc Phoenix and Nice Airport from my hotel in Nice - the first time I have seen it. Incidentally, Nice is pronounced like the English word "niece" not like the English word "nice", but that doesn't stop the obvious jokes. Perhaps you could combine them like "you have a nice Nice niece". 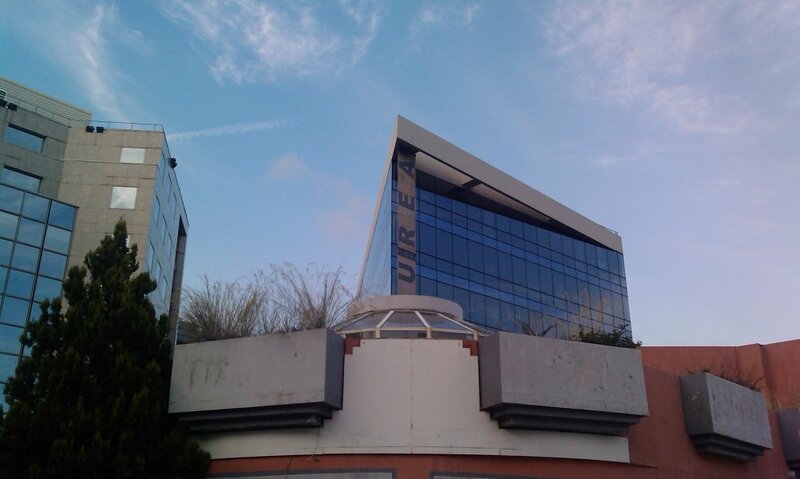 A building with no self-respect, next to Parc Phoenix. Not sure I would want to visit that. Nice, and the Mediterranean. In the distant cloud are Cime du Farguet (1187 metres), Mont Méras (1237 metres), Cime du Baudon (1265 metres) and Mont Agel (1148 metres). In the visible foreground are Mont Gros (375 metres), Mont Leuze (581 metres), Mont Alban (233 metres), Mont Boron (191 metres) and the Le Sémaphore peninsula. The Nice seafront, called Promenade des Anglais (walk of the English). 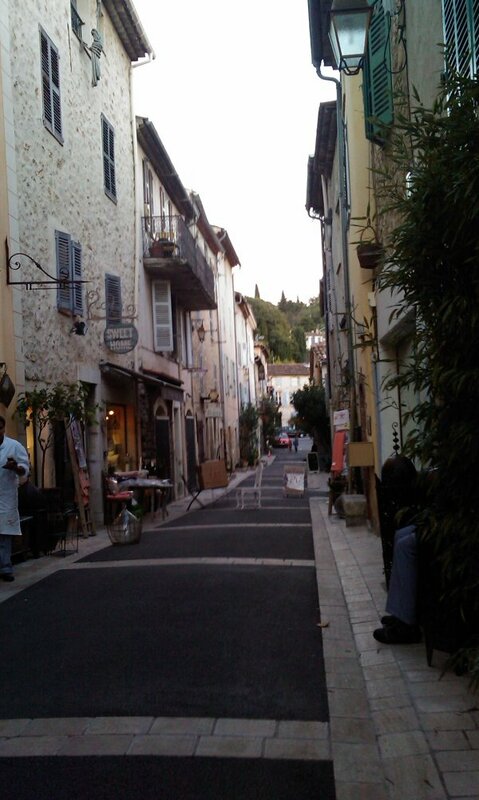 This part of France is a Victorian-era holiday resort, catering to the English market. Part pebble beach (yay! ), part rough sand. In addition to the previous mountains, Mont Macaron (806 metres and 796 metres) appears on the left, Cime de gonella (1839 metres) and Mont Panard (1054 metres) are barely visible through the clouds. 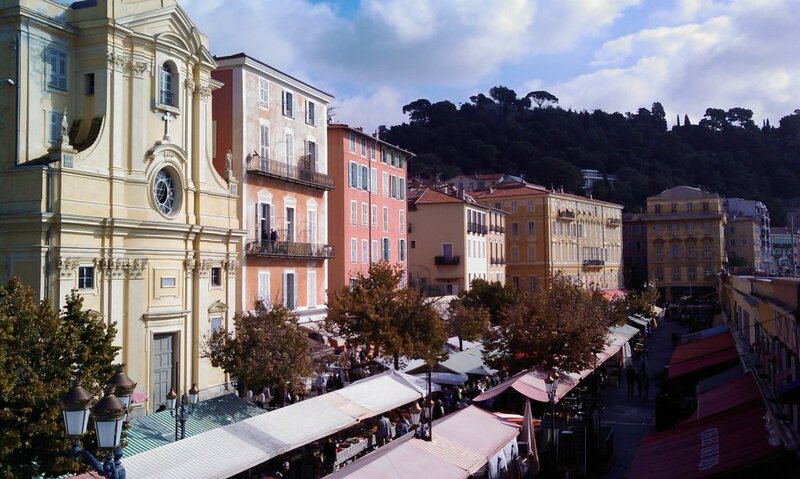 Cours Saleya market in the old Nice town. The 80 metre green hill is Colline du Château. I took this picture expecting it to be a palace or grand civic building. Turns out it is Lycée Général Masséna; the local high school. Nice does not do things by half, it seems. Le Var estuary, with a distant view of La Cagne valley on the left and La Var valley on the right. The mountains on the left are Baou des Blancs (673 metres), Baou des Noirs (640 metres), Sommet de Viériou (1395 metres), Baou de Saint-Jeanett (801 metres), Mouton d'Anou (1079 metres), Baou de la Gaude (796 metres), La Colle (844 metres), an unnamed 903 metre bump, Mont Péloua (880 metres), Sommet du Broc (892 metres), Mont Vial (1550 metres), Mont Girard (2606 metres), Cime des Lauses (2651 metres), Mont Pépoiri (2674 metres), Mont Tournairet (2086 metres) and part of the surrounding Maritime Alps. 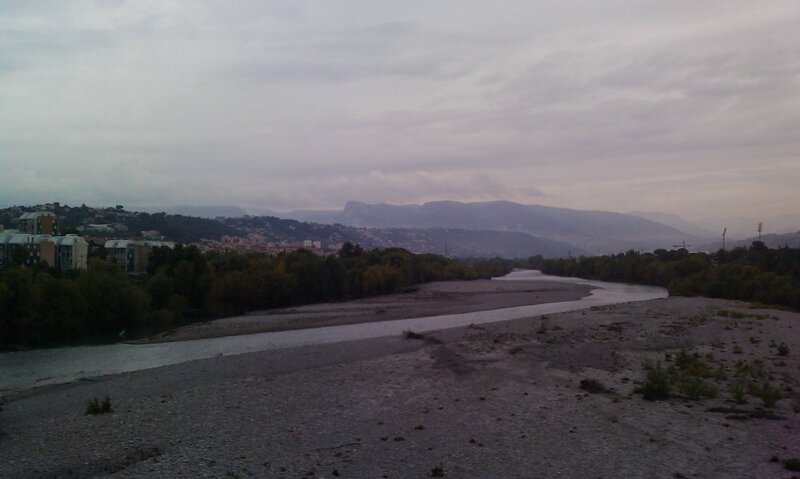 Arriving in Opio, looking towards Châteauneuf. 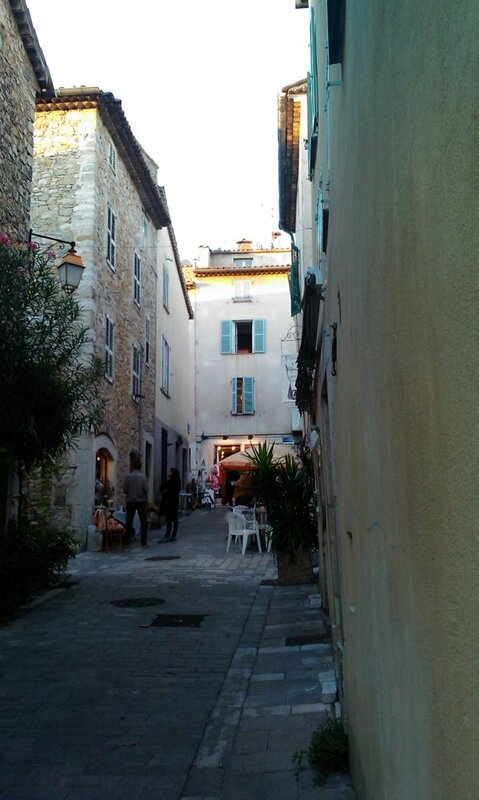 The village on the hill is the historic village of Châteauneuf Grasse. The peak behind it is 662 metres, while hidden in the cloud behind it is Le Haut Montet (1335 metres). I make no apology for the rain; those rivers are there for a reason. Just a week beforehand, the French Riviera had suffered severe flooding, and 19 people had died in Antibes. 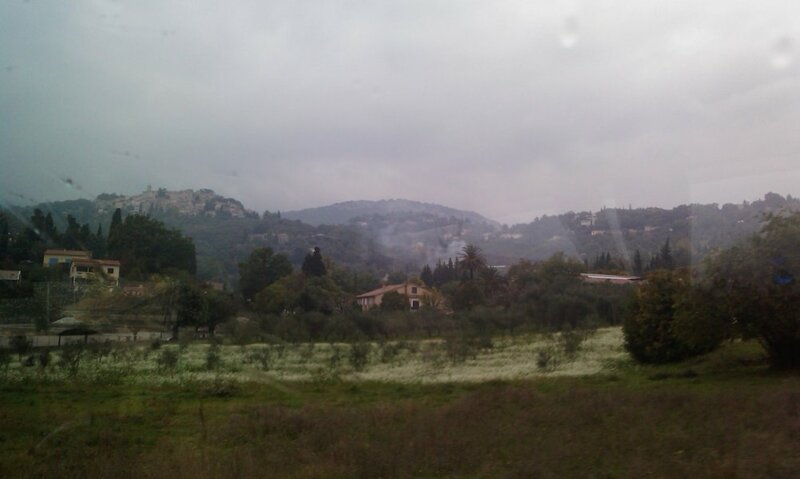 The weather that greeted us at Club Med Opio en Provence. This is a bizarre little place. A resort in the middle of nowhere, surrounded by some of the most stunning scenery (when it is not raining), catering to people who never want to leave the resort. Swimming pools, archery, trapeze, offroad buggies, daily stage shows for children, nightclubs, and a resaurant with a constant supply of international dishes. Catering mostly to families, who go for views of the mountains but don't actually visit the mountains. Near the coast but slightly too far to visit it. Next to the sunny Mediterranean, but in a place where it rains heavily. Superb view of the mountains from Opio en Provence. Le doublier (1248 metres) behind the trees, Colle du Maçon (1417 metres) and an unnamed 1300 metre peak peeking over the edge above the trees, Le Haut Monet, Le Colle de Rougiès (1336 metres), the superb Le Loup glacial valley with Cime du Cheiron (1778 metres) and Jérusalem (1768) metres at its head, and Pic de Courmettes (1248 metres) on the right. Rue du Pontis in the old village of Valbonne, a 2 km walk away (well, it was supposed to be 2 km, but we went the opposite direction first, half way to Opio centre, turning a 4 km round trip into a 7 km walk). Rue Alexsis Julien. Narrow grid layout, with tourist shops everywhere. 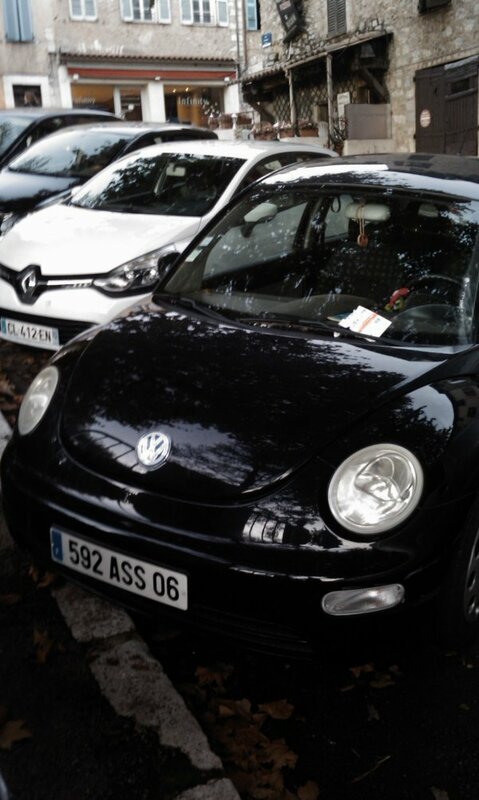 Even the cars don't take themselves seriously. Rue Gambetta.